Active multiplayer community. Use the Unofficial Patch to be able to see servers. Installing the Windows Live application is mandatory to install the game but not necessary to run it. Retail version owners can use the LIVE key to activate the Steamworks version. Also, the LIVE version is available to Steam version owners who miss the features removed during the transition to Steamworks or who use mods incompatible with the Steamworks version. New Steam version update removed DirectX 10 and Nvidia 3D Vision support and introduced some minor bugs. SecuROM v7 and Games for Windows - LIVE DRM. All retail product keys activate on Steam (Games for Windows Marketplace product keys do not work). The Mercenaries United was never made available for the PC version. Fixes the region lock and allows you to join/see any multiplayer server, gives weapon to AI, fixes versus bugs, etc. Crosshair can be replaced with laser sights when playing with keyboard and mouse. Use Resident Evil 5 Gold Edition Unofficial Patch to configure. Removes unnecessary HUD character names and dark circles around health. A version compatible with the DualShock button mod can be found here. 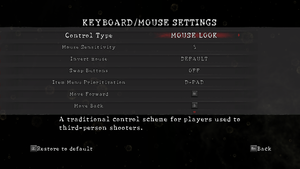 Disables the notification when you switch between controller and keyboard and mouse. When trying to move/backup save games in the GFWL version, including the folder %LOCALAPPDATA%\Microsoft\XLive\ is essential. This folder needs to be restored back to the same location. Letterboxed black bars in cutscenes. Menus are Vert-, game will crash on level load. See the WSGF entry. Menus are Vert-, ultrawide resolutions can be selected but will crash game on level load. See the WSGF entry. Use this mod. May cause minor bugs in DLC content. 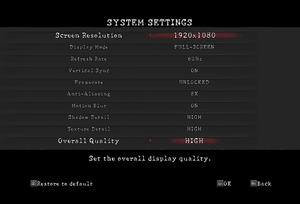 Set via 'Overall quality' (4x or 16x) or force in the graphics card control panel. Up to 8x MSAA and 16x QCSAA, causes black outlines around objects. Frame rate is capped at 120 FPS, even if unlocked frame rate and higher refresh rate have been selected. 3D Vision Fix adds hotkeys to toggle color filter, depth of field in cutscenes, HDR/bloom level, HUD, and disable heat waves and lens flares. Use Resident Evil 5 Gold Edition 3D Vision Fix. The filter is disabled on the bottom. Disabling the color filter will make the game look more colorful, but sometimes more washed out in dark chapters. Download Resident Evil 5 Gold Edition 3D Vision Fix. Press F6 to toggle the color filter used in-game. Extract all but effect folder into the installation folder. Only works with the DX9 executable. Decreasing the in-game brightness is recommended to compensate for the lack of filter. Doesn't remove the pink filter in the ending of Lost in Nightmares. For an additional color boost, download this and extract it to the installation folder. Replace all files with it. Brightness should be normal. Don't Alt+Tab ↹ on fullscreen mode or it will crash. launcher.exe error requires mouse. See Issues with Games for Windows - LIVE. Choice of four presets only. See Controller remapping. With DirectInput, you can alternatively use XInput wrapper. For DualShock Prompts see DualShock Button Prompts. 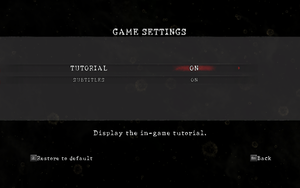 When mapping a button which already is mapped to another function, a warning will show up, informing the player that the controls may not work properly. To solve this, just either unbind the other function or preferably just remap it to another unused button. Edit the button numbers as desired. 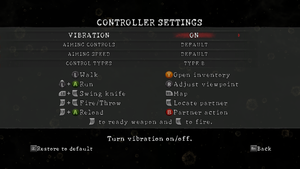 Controller button numbers can be found by opening Set up USB game controllers (accessed by ⊞ Win+R and joy.cpl), clicking properties, and then switching to the Test tab. Actual button number is -1 from shown, e.g. if button 1 lights up, it's button 0. DualShock 1 and 3 variants available for both Steam and GFWL versions of the game. 2 Use the Splitscreen Mod. 2 players Co-op, 4 players Versus. Use the Versus Mod or Untold Stories Bundle DLC (official support). This mod enables split screen coop in the GFWL version, which was left hidden in the code of the game. While it is only playable with gamepads, it is possible to use a keyboard via PPJoy. This mod is also included in the versus mod mentioned below, making this mod obsolete. Split screen is impossible in the Steam version because the code was removed. However, there is a way to revert to the GFWL version by following this instruction. Official support for versus mode is included with the Untold Stories Bundle DLC. This mod enables versus mode in the GFWL version, which also was left in the game's code. Native for GFWL. See Helix Mod: Resident Evil 5 Gold Edition. See Games for Windows - LIVE Issues fixed. As of Steamworks update, game does still require GFWL components to be installed so users are able to import their save game data and achievements, even though it isn't used with main game. Launcher errors, such as res = 1, err = 0x0000007e and res = 1, err = 0x00000012, are GFWL related and is possibly linked that there's no GFWL related data found. Game should still work normally, but as window requires manual closing it breaks full controller compatibility and may get irritating. 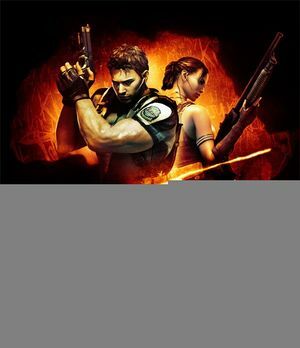 Use Resident Evil 5 Gold Edition Unofficial Patch. In chapter 6-1, sometimes the Majini with a key card can't jump down after spawning and you can't kill him to get a key card. 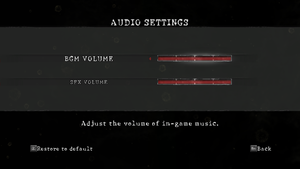 Use Resident Evil 5 - Chapter 6-1: Ship Deck bug fix. Error messages caused by an unsupported video mode: ERR09: Unsupported function and mpSwapChain->REsizeTarget(&mdesc). Look for Resolution and RefreshRate and change to a known good setting (e.g. 640x480, or disable FullScreen). This flickering can occur on modern graphics cards and drivers, popping up as frequently as several minutes or as infrequently as every couple hours. While playing, Alt+Tab ↹ to switch back to your desktop or another window. Switch back to the game. The flickering will not occur again. The game will retain all its original visuals, and performance will not be significantly impacted. 9, 10 Direct3D 10 was removed from the Steam version. 3, 4 Direct3D 10 was removed from the Steam version, inherently removing Shader Model 4 support. ↑ 2.0 2.1 File/folder structure within this directory reflects the path(s) listed for Windows and/or Steam game data (use Wine regedit to access Windows registry paths). Games with Steam Cloud support may store data in ~/.steam/steam/userdata/<user-id>/21690/ in addition to or instead of this directory. The app ID (21690) may differ in some cases. Treat backslashes as forward slashes. See the glossary page for details. This page was last edited on 11 April 2019, at 21:09.